Bottoms Up is a gorgeous ocean front home, tucked away in a quaint, neighborhood-like setting, but conveniently located in the heart of all there is to see and do on the Outer Banks. Experience breathtaking views of the sun, rising over the ocean from the top level deck, or stroll down your own private walkway to the beach and enjoy the scenery from the dune top deck; a perfect place for a morning or afternoon beverage or just time to reflect and watch the waves roll in. Unwind in the private13’ x 25’ pool, or take a soak in the hot tub while all of your cares melt away. This home is your ideal beach getaway. Bottoms Up boasts 8 bedrooms (6 generously sized masters! ), each with a flat screen TV. 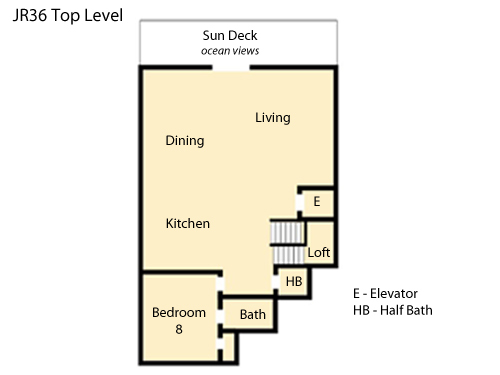 3 of the masters (including the disability accessible bedroom) face the ocean and have direct deck access. The ground level offers a rec room with pool table, wet bar, full size refrigerator/freezer, microwave, TV, DVD player, and access to the pool area and charcoal grill. 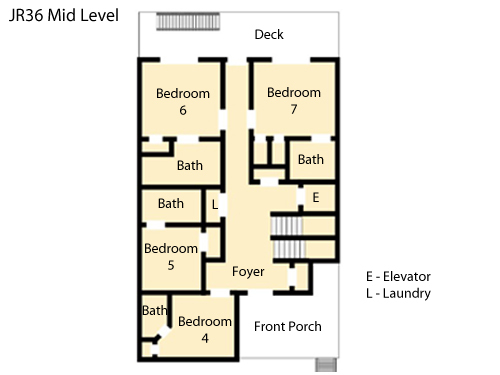 The top level features a king master bedroom with a private bath and jetted tub. Also on the top level is a large, but cozy living area with a TV, Blu-Ray DVD player, a gas fireplace, dining area with seating for 16, a well-appointed kitchen with bar seating for 5, and a loft with a desk.No need to carry your groceries or luggage up the steps, use the elevator that goes to all floors! If you need to stay connected WiFi is provided. There is plenty of parking and maneuverability for up to 6 vehicles. 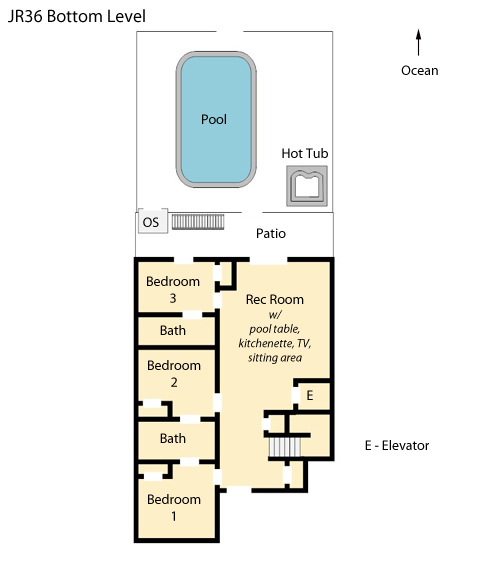 Disability Friendly Information: Elevator access to all floors.Entryway - 4 inch lip.Elevator - 46 inches deep x 32 inches wide (28 inches wide thru the accordion door)Bedroom 6 - King Mid Level - Bathroom door is 36 inches wide. Roll-in shower with a folding seat and handrails. Roll under sink is 28 inches high. Commode height is 18 inches. No other railings other than shower area. Access to decks through slider doors is 28 inches wide with a 4 inch drop. Access to pool area also has 4 inch drop to deck. *If there is specific information you need to have regarding access for a person in a wheelchair or with limited mobility please let us know. We had a great time at this beautiful house, even though the weather did not cooperate. We had a problem at the beginning, but as usual Village Realty solved it quickly! You can always depend on them! Since we had a group of elderly women with many disabilities we had a few problems. There was only one walk in shower, and getting into tubs was difficult. That was our fault, since we should have investigated that beforehand. Luckily, there was a beach access 2 houses down, with ramp accessibility for us to use, since climbing stairs is a problem for us. We had an elevator for access inside the house. This is a great home for families! All in all, we had a very delightful vacation!Thank you Village Realty for being a great part of that! O-H-I-O! in the pool picture! Another wonderful family reunion and vacation at Bottoms Up! We enjoyed beautiful weather and the house was perfect for all 20 of us. Adults loved the great room and decks and the little ones loved the pool. All of us loved the beach! We had a wonderful time during our stay. It was very hot, but what do you expect? The house was beautiful. Everyone enjoyed the pool and hot tub. I'm not sure what the other reviewer meant about the grill, but we had a large gas grill. It worked great and we used it almost every night. We will definitely be back! We checked in today to a wonderful home for the week . Much to my surprise this $11,000 rental does not have a gas grill. We stay in the OBX every year and rent a large house and plan to cook a lot while we are here. This was VERY disappointing! There was a very small charcoal grill that would not allow you to cook for the amount of people in the home. The listing simply says grill...way understated. We just called and spent another $100 on renting one for the week. We will certainly not recommend this location to anyone in the future. Thank you for taking time to share your recent experience while visiting the Outer Banks. It was a pleasure speaking to you personally Ellen on the phone, and when we shared your comments with the homeowner, they asked us to purchase a new gas grill for the house. We are so happy that we could deliver it in time for your use this week. I sincerely hope overall memories were made, and you enjoyed your time while staying at Bottoms Up. We look forward to welcoming you and your family back to the beach in the near future for another great year. Loved it! I don't know how it could be any better!